The Riserva Naturale di Monte San Calogero is on Mount Kronio (m. 388). Its name comes from the popular belief that Saint Calogero found refuge in one of the caves. Typical are the underground caves, such as the Stufe di San Calogero, the Grotta del Lebbroso (the Leper’s Cave), the Grotta di Mastro (the Master’s Cave), the Grotta Cucchiara, and the Grotta Gallo (Rooster Cave). All these caves are adjoining and affected by a secondary volcanic phenomena that causes the emission of sulfuric vapors that reach a temperature of 40°C circa. Thanks to this phenomenon, the Stufe di San Calogero (Saint Calogero’s Stovepipes) have become a famous thermal center. The caves were inhabited in prehistoric times (the artifacts are preserved at the Antiquarium nearby) and frequented since Greek times. At the foot of the mountain it is possible to visit the “Enchanted Castle” (Castello Incantato), a pretty olive grove where you can see heads carved in stone or in the trunks of the olive trees by the artist-farmer Filippo Bentivegna, who passed away in the ‘60s. 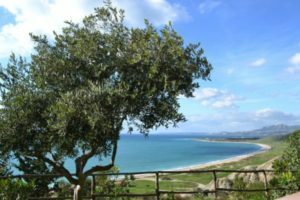 There are several excursions you can make in the San Calogero reserve, on bike or on foot, where you will be able to admire magnificent views of the mountains sloping into the sea. The Riserva Naturale di Capo San Marco is famous for its inlets and their magnificent panorama and sandy beaches. Much frequented by tourists, it is about 8 kilometers from the historic center of Sciacca and has a comfortable parking lot nearby. In the reserve you will discover evocative sea floors and rare flora and fauna. It is also a hunting area, as it is rich in game.